With his unique personality and teaching methods he made a lasting impression in the minds of generations of film students at the Film Institute. He opened their eyes and made them see films in a different way for the rest of their lives. People from different walks of life coming from all parts of India started appreciating films in an artistic manner through the courses conducted by him. Prof. Satish Bahadur had single handedly carved a niche in Film Studies in India and had cultivated Film Appreciation in to a separate form of art. Prof. Bahadur started his career as the head of the department of Social Science in Agra College where he had created two film societies. Noted Film Critic Ms. Marie Seton suggested to Mrs. Indira Gandhi that the newly inaugurated Film Institute of India should have an additional department of film appreciation and further told her that the first person to be considered for the job should be none other than Prof. Bahadur. Prof. Bahadur invented his own teaching methodology, making full use of the National Film Archive at the Film Institute. In the time to come, the format of Film appreciation created by Prof. Bahadur would become standard format for all future courses in India in Film appreciation. Along with P.K. Nair, the founder director of the National Film Archives, Prof. Bahadur for nearly twenty years toured the big and small towns in the country teaching cinema to lay audiences. Some of the young people even considered film making as a career option owing to his influence. The person who made the most indelible impression on me at the Institute was Prof.Bahadur. In those days, I had a great liking for Actor Omar Sharief after viewing David Lean's LAWRENCE OF ARABIA and DOCTOR ZHIVAGO. With his handsome looks, hair falling in his forehead and square jawline, Prof. Bahadur reminded me of the great actor Omar Sharief. His charming personality and child like enthusiasm made him the most popular person at the Institute and he was always found surrounded by groups of students. His lectures at the class room theatre were a delight to attend and students never missed his classes. He was a chain smoker at that time and used to smoke even while lecturing at the classes. Often he will take out tobacco and paper from the pouch and roll out a cigarette while speaking and try to light it after several failed attempts. After one or two puffs it will go off and he will continue to drag at the unlit cigarette stub! His call "Ramayyan" to the projectionist to start the screening in the class room still rings in my ears even after a passage of many years. After leaving the Institute I never had an opportunity to meet him, but I was looking forward to seeing him some time during the year long 50 th Anniversary celebrations of the Institute. The inaugural ceremony I could not attend and my good friend Sound Engineer Muralidharan had sent me some photograph, in one of which Prof.Bahadur is seen receiving a Memento from veteran Actor Dev Anand. Unfortunately Prof. Satish Bahadur passed away on Saturday,24 July, 2010 after a brief illness. He was 85. Even after retirement, Prof. Bahadur continued to participate in seminars and wrote film analyses in academic periodicals. 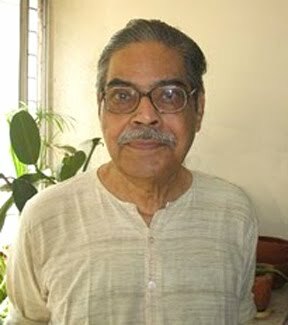 At the time of his death, Prof. Bahadur had just completed the editing of a book analyzing the film Pather Panchali which is likely to be released later this year. For his lifelong work dedicated to opening new vistas in film studies, Prof. Satish Bahadur remained unrecognized by the Government, the Indian film industry and even by his former students who became eminent film personalities. I sincerely pray for his soul to Rest in Peace and express my heartfelt sympathies to the members of the revered teacher's family. He was so sweet and so gentlemanly! I remember booklet with an analysis of Pather Panchali that he'd given us during the FA course. And the way he talked so lovingly about the design of the film. He was a nice person. Good teacher. Such an inspired teacher. I attended his classes in Pune institute. He was lightened me so many aspects of film and film technology. He introduced me such a Great films like Esentien's Battleship Pottemkin and Bert Hanstra's Glass and so on. I never forget him throughout my lifetime. Such a nice article about Prof.Sathis Bahadur.